The 13SGH stump grinders’ unique design pivots over the center line of the wheels, allowing the grinding head to sweep easily across the stump, while the wheel base remains stationary. Engine options include the Honda GX390 or the 16hp Briggs & Stratton Vanguard V-Twin. 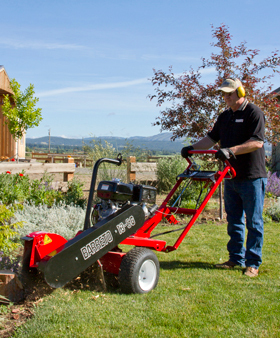 The innovative design and compact stature of this stump grinder makes it ideal for tight access areas. The swivel head has a swing arc of 35˚ and the cutting wheel has eight carbide green teeth with three cutting surfaces. Free-wheeling hubs facilitate easy travel to the jobsite, while the independent wheel locks allow for easy locking while grinding. The height of the 13SGH operator control handlebar can be easily adjusted to suit both the operator and the grinding situation. The cutter wheel is operated by the handlebar-mounted safety bale and fully-throttled engine. The handle bale acts as a secondary safety switch to prevent accidents. The operator uses the handlebars to manually control the head swing and depth of cut. 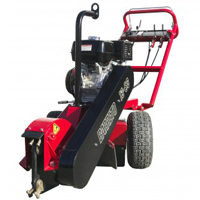 With a unique design that provides limited need for maintenance and repair, these stump grinders will remain in the field getting the job done instead of tying up your revenue and mechanic. Because Barreto stump grinders are reliable in difficult conditions, customer satisfaction is high. Save time, money, and maintenance with the eight carbide green teeth that have three cutting surfaces each. The innovative pivot over center swivel head design allows the grinding wheel to sweep easily across the stump. Easy to operate controls are located on the adjustable-height handle bar, and the safety lever requires operator presence.